Information security is everyone's concern. The way we live is underwritten by information system infrastructures, most notably the Internet. The functioning of our business organizations, the management of our supply chains, and the operation of our governments depend on the secure flow of information. 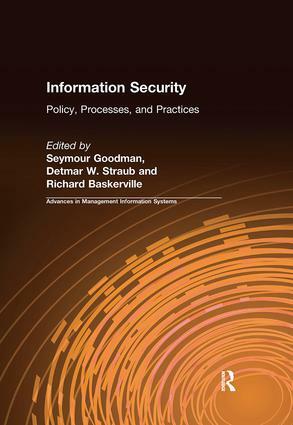 In an organizational environment information security is a never-ending process of protecting information and the systems that produce it.This volume in the "Advances in Management Information Systems" series covers the managerial landscape of information security. It deals with how organizations and nations organize their information security policies and efforts. The book covers how to strategize and implement security with a special focus on emerging technologies. It highlights the wealth of security technologies, and also indicates that the problem is not a lack of technology but rather its intelligent application. This economical text is intended for use as a universal supplement to introductory econometrics courses. This edition contains two new chapters on economic forecasting. Extensive online supplements include teaching PowerPoints, solutions to test questions/problems, new instructor questions, and software programs with data to download.